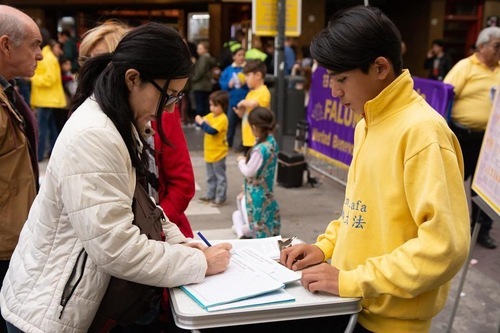 Prior to the start of the G20 Summit in Buenos Aires on November 30, the Falun Dafa Association in Argentina submitted over 30,000 petitions to President Mauricio Macri on November 27. The petitions urge President Macri to talk with Chinese leader Xi Jinping during their meeting on December 2 to stop the suppression in China. Falun Gong, also known as Falun Dafa, is a spiritual practice based on the principles of Truthfulness-Compassion-Forbearance. It has been persecuted by former communist leader Jiang Zemin and the communist party since July 1999. Over 4,200 practitioners have lost their lives as a result of torture during police custody, according to information obtained by Minghui. 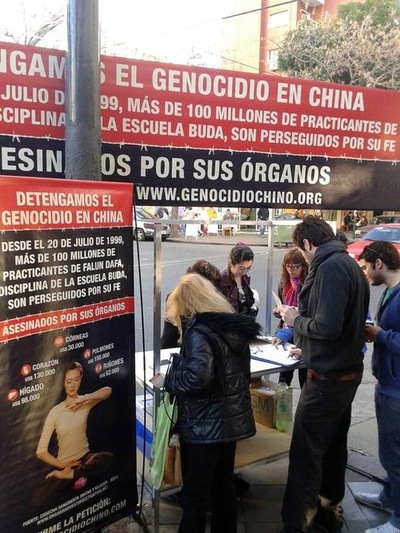 A booth in Buenos Aires prior to the G20 Summit informs passersby about the suppression of Falun Gong in China. 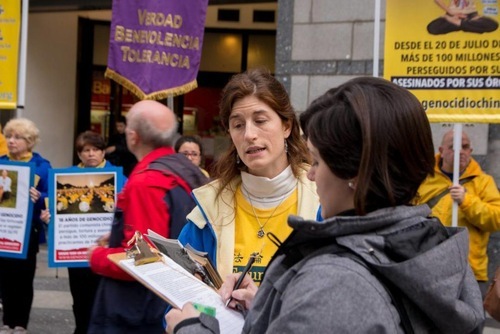 The petitions have been signed by citizens in both Argentina and neighboring countries who have learned about the persecution through news media and practitioners’ events. People sign petitions after learning about the human rights violations being perpetrated against Falun Gong practitioners in China. For more than a decade, practitioners have been raising awareness to end the persecution and bring Jiang to justice. The letter submitted to President Mauricio Macri from the Falun Dafa Association in Argentina listed some of the progress made in Argentina. Octavio Araoz de Lamadrid, a judge on the Argentina Federal Court No. 9, issued an arrest warrant on December 17, 2007, for Jiang and his follower Luo Gan, former head of 610 Office. The two high-ranking officials were charged with crimes against humanity. Judge Lamadrid ordered the Interpol Department of the Federal Police of Argentina to carry out the arrest. Influenced by the Chinese Embassy in Argentina, the case was temporarily halted. It was later reopened after consistent efforts from human rights advocates. When Xi visited Argentina on July 18, 2014, practitioners held rallies near the Sheraton Hotel, the presidential office building, and the National Congress Palace to call for an end to the suppression and to bring Jiang to justice. Thugs hired by the Chinese Embassy repeatedly harassed and attacked practitioners. Argentinian police arrested one deputy military attaché from the embassy for crossing the police barricade and attacking practitioners.